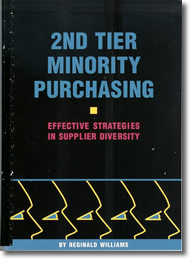 The nation's most widely read text on the subject of supplier diversity is a simple "how to" resource manual of 119 pages containing everything you always wanted to know about diverse business procurement, but were afraid to ask! It's handy as a desktop reference and easily used... a must for your resource library and professional development. 10% discounts available for purchases of 10 or more. as well as common questions and answers. The PBS Roundtable Video Series . . . a syndicated broadcast, Town Hall style video presentation, bringing together leaders of major corporations with minority and women enterprises. We have selected 20 of the nation's premier corporations for a unique opportunity to share best practices in this Supplier Diversity Roundtable Series hosted by PBS stations in key regions throughout the U.S. Led by host and facilitator, Reggie Williams, panelists speak to the importance of supplier diversity as well as best practices that visionary companies are using to successfully meet these challenges. We also discuss successful business models, while sharing supplier diversity success stories. Corporate participants include: The Marriott Corporation, US Postal Service, General Motors, Hewlett Packard, Procter & Gamble, and several other leaders in supplier diversity. 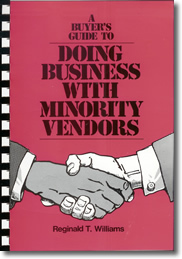 Let us make supplier diversity a reality in your organization!